Mordecai Richler is a Québécois! The readers of AngryFrenchGuy have spoken! Whether he likes it or not, Mordecai Richler was a “part of the tribe” even though he was Anglo and Jewish. 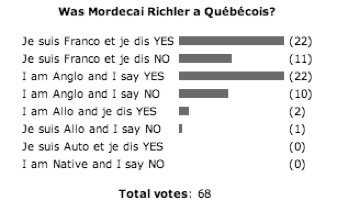 And although the vote was anything but unanimous, Francos, Anglos and Allos are just about equally divided on the Québecness of Mordecai. Ten Years after an infamous series of articles in the New Yorker by Mordecai Richler that permanently fixed in the English-speaking psyche the idea that Québec as an anti-semitic backwater, the New York Times finally gave someone an opportunity to defend the province’s honor. Filmmaker and novelist Jacques Godbout wrote 3000 words for the NYT titled A Symbolic Nation Aspires to the International, published just as a massive festival of Québec culture – just about big enough to actually get someone’s attention in that city – was kicking off at the World Financial Center in downtown Manhattan. The article was published on September 16th 2001, five days after that thing happened. No one ever read it. Most of the Québec/New York 2001 exhibition was buried under the 20th century. In his piece Godbout calls Richler Québec’s greatest writer. He recalls that they had both left for Europe in 1954 to escape Québec’s stagnant conservatism. Godbout returned in 1960 as the Quiet revolution was starting. Richler only came back in 1972. Godbout argues Richler never understood the old reactionary and priest-ridden Québec of is youth was gone. That’s probably not fair. Mordecai Richler new very well that attacking the Québec nation from outside, in English, was precisely the best way to summon that old defensive reflex that people swore was gone. That was his way. He looked at society, found tender wounds and jabbed repeatedly with his Bic pen. That said, Mordecai Richler did not play fair either. He started his fight in New York, an arena where no one from Québec had the stature, let alone the command of English, to rebut him. A more courageous writer would’ve wanted an adversary. Posted in Who is Nous? To Be or Not to Be Nous? The Barbara Kay Problem. Exactly 50% of participants to the AngryFrenchPoll on Québec identity have said that they consider National Post columnist Barabara Kay to be a Québécoise. The other half don’t. Not surprisingly, Francos and Anglos don’t see things the same way. 64% of Anglos think she is a Québécoise, while only 22% of Francophones think so. The article also informed us that “all Jews are federalists”. Salomon Cohen, Paul Unterberg, Henry Milner, David Levine and Armand Elbaz apparently are not Jewish. The results of the poll are expected to hurt and trouble Ms. Kay who has lived in Québec most of her life and has always strived to be an active and dynamic part of her community. 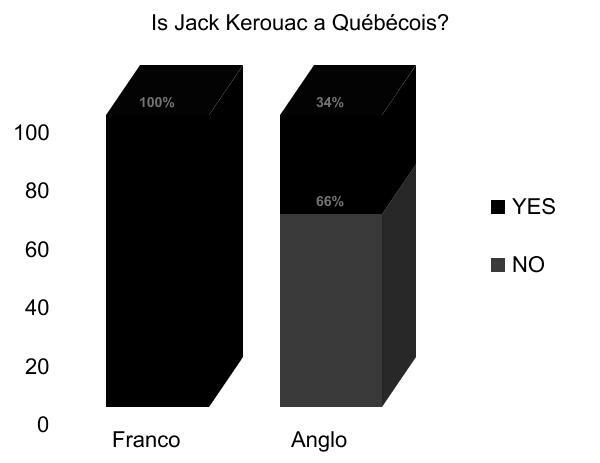 100% of AngryFrenchGuy.com’s angry Franco readers who took part in the Who is Nous poll consider American writer Jack Kerouac to be one of them: a Québécois. Two thirds of angry Anglos did not. Jack Kerouak was born in Lowell, Massachusetts. His French-Canadian parents had been part of a massive wave of emigration to the factories of New England that followed the industrial revolution. In those days Lowell and many other northeastern American towns had thriving French-speaking communities known as “Little Canadas” and Kerouac himself did not start learning English until he went to school. When Jack Kerouac was growing up in the 1920’s and 30’s, Lowell, Massachusetts and it’s 28 000 French-speakers could’ve been considered the fourth largest French-Canadian city after Montreal, Québec City and… Fall River, Masachusetts! The once thriving Franco-American community that once had as many French-language newspapers as Québec has now all but disapeared. New immigrants stopped coming when the textile mills closed and half of the 900 000 French-Canadians returned home. The others eventually were assimilated into mainstream American society. Click here or on the picture above for a link to a 1967 Radio-Canada interview of Jack Kerouac in French. Two out of three participants in the AngryFrenchGuy’s Who is Nous? poll feel the late Oscar Peterson should be included in the definition of a Québécois. 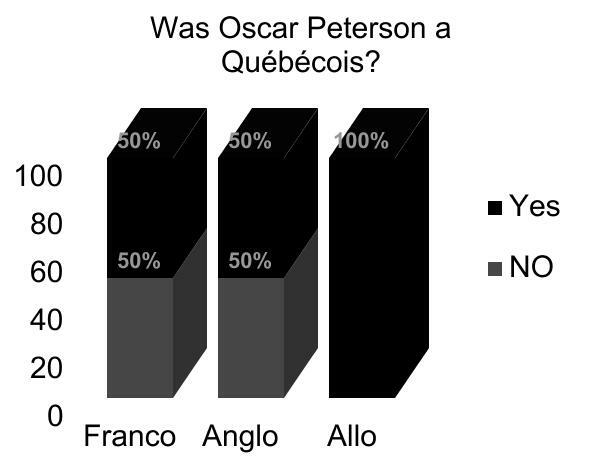 Both Francophones and Anglophones were split 50/50 on the issue but 100% of Allophones who answered did not hesitate to say Oscar Peterson is one of us. It is interesting to note that in a previous poll 100% of Allophones said another former Montrealer, Leonard Cohen, was not a Québécois. Oscar Peterson was born in Montreal in 1925. He grew up in Saint-Henri, a working class neighborhood that was mainly populated by the French-Canadian factory workers who worked along the Lachine Canal but also had small Irish and black pockets. Oscar Peterson’s father was a CN railways porter, one of the few professions available to black men at that time. St-Henri is situated right at the base of Mount-Royal and the massive mansions of Westmount, then Canada’s wealthiest municipality, towered directly above. Other famous Montrealers from Saint-Henri include fellow jazz pianist Oliver Jones, the legendary strong man Louis Cyr, comedian Yvon Deschamps and the former Parti Québécois MNA and first female cabinet minister in Québec, Louise Payette. Oscar Peterson left Montreal in 1949 for the United States where he played with many of the greatest jazz musicians of his time. He lived his later years in Toronto where he was chancellor at York university and even considered for the position of Lt-Governor of Ontario. Click on the picture above for a link to a rare Radio-Canada archive of Oscar Peterson speaking French and playing one of his most famous compositions: Place St-Henri. The results are in. 100% Francophones who answered the AngryFrenchGuy’s totally unscientific Who is Nous poll, consider Leonard Cohen to be one of them, part of Nous, a Québécois. Anglos are split right down the middle and Allophones don’t see Leonard Cohen as a Québécois at all. 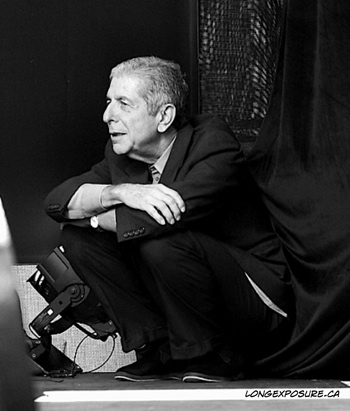 Born in 1934 in Montreal, son of Jewish immigrants, Leonard Cohen lived most of his youth in Québec and studied at McGill university before eventually moving to the United States. As it was common in those days in Montreal’s immigrant communities, he was raised to be and English-speaker.